This article states that it "aims to kick-start a debate about how Anarchists should respond to the development of Islam and Islamism in the United Kingdom. It is a debate that is long overdue." We do not agree with it but reproduce it as a contribution to discussion (our response is here). Originally published in January 2011. Update: In 2015, Paul Stott confirmed on his blog that he had voted UKIP in the 2015 General Election, and was quoted as a UKIP member by the Irish Times in 2016. This article aims to kick-start a debate about how Anarchists should respond to the development of Islam and Islamism, (which I define as the political presence of Islam and the desire to develop norms of Muslim behaviour) in the United Kingdom. It is a debate that is long overdue. There are few things correct about Samuel Huntingdon’s clash of civilisations thesis, but one element he did get right was in recognising that the late twentieth century saw a global Islamic resurgence. That resurgence was – and is – an event as important as the French or Russian revolutions. The French expert on Islamism, Gilles Kepel, traces this resurgence to material factors. Urbanisation and population increases brought about by medical improvements fractured traditional rural brands of Islam in countries such as Egypt and Pakistan. This combined with the coming to power of anti-colonial movements in the Muslim world. These governments – whether nationalist, monarchical or ‘Socialist’ – usually failed to deliver the aspirations of liberated peoples, and instead became characterised by corruption and incompetence. Islamic evangelism provided – and continues to provide – ‘answers’ to such problems. That answer is Islam, a complete design for living. And that answer is applicable globally. As late as 1989, it was very rare to talk about British Muslims, or Muslim communities. The existence of a conscious, political British Islamism arguably emerges from the most contentious background of any ‘ism’ – the agitation against Salman Rushdie, following his book Satanic Verses, and support for the death sentence issued by the Ayatollah Khomeini. Writers such as Kenan Malik and Anandi Ramamurthy have covered the fact that historically British Asian politics was both vibrant and often left leaning, via groups such as the Indian Workers’ Association and Pakistani Workers’ Association. A generic black or Asian identity was common – religious designation, and religious division only emerging after top down multi-culturalism was introduced from both national and local government following the 1980s riots. Here communities were given labels, political representatives found for those labelled, and resources and political influence distributed accordingly. The realisation that sections within Muslim communities, voting as blocs, could come to hold considerable political influence soon became evident to all of the major political parties. As left communists Aufheben illustrate [in their article Croissants and Roses, 17/2009 – the ed. ], this stripe of multi-culturalism has little to do with progressive politics. One of those instrumental in calling for a national Muslim representative body was Conservative right-winger Michael Howard. In the decades since the Rushdie affair, the Muslim Council of Britain and the Muslim Association of Britain have come to considerable prominence, and Kepel is not alone in arguing that this influence mirrors, in part, colonialism. Representatives of the local power simply cut deals, on a ‘you scratch my back and I scratch yours’ basis with the governing power. In time, it is in both sides’ interest to maintain such arrangements, providing they work. Many English cities have witnessed the curious sight of Asian (usually but not always Muslim) councillors switching overnight from one political party to another. During the war between Israel and Hezbollah in 2006 a group of Muslim councillors in Margaret Beckett’s Derby constituency made the shock discovery that the Labour government supported Israel and would not condemn it for bombing civilians. Whatever next! They promptly switched to the Lib Dems, although cynics suggested their move had more to do with thwarted local ambitions, and offers from their new party, than anything else. Perhaps the classic example of just how scurrilous local politics has become in some cities is the 2008 defection of Tower Hamlets Respect Councillor Ahmed Hussain – all the way to the Conservative Party! It is important to stress the centrality of the mosque in some of these developments. For some years now a reading of sources as diverse as Private Eye, the East London Advertiser, academics such as Delwar Hussain or journalists like Andrew Gilligan would lead you to the conclusion that the most important political institution in east London is not the Labour Party or a trades union – it is East London Mosque, dominated by the Islamic Forum of Europe and Jamaat-e-Islami. The election of Galloway, and a mosque-backed Independent in the 2010 Tower Hamlets mayoral election, reinforced this. In Waltham Forest, at one point no fewer than 16 councillors were attending Lea Bridge Road mosque – what price political openness and transparency in such circumstances? It is worth noting that in office, Islamists have proved as useless at representing the interests of the working class as anyone else. Whilst Tower Hamlets residents are paying for the dubious honour of being a ‘host’ borough of the 2012 Olympics, all the events scheduled to occur in London’s poorest local authority have now been moved somewhere else. Whilst Independent Mayor Lutfur Rahman mouths impotently about legal action to bring the marathon back to the East End, the Chairman of East London Mosque, Dr Muhammad Bari, sits alongside Princess Anne and Lord Coe on the board of the London Organising Committee of the Olympic and Paralympic Games. The presence of Dr Bari’s beard ticks the multi-cultural box, but delivers nothing for the people of Tower Hamlets. One area where national power expects local power to deliver is in the reduction of radicalisation and terrorist plots from Islamist youth. Although rarely acknowledged, a small, but not insignificant number of British Muslims have been fighting, killing and dying in their version of Jihad for the best part of three decades, in places as diverse as Bosnia, Kashmir, Yemen, Afghanistan, Somalia, Iraq and Israel. The first British suicide bomber died in Srinagar as far back as 2000 – so much for the idea that such attacks solely occur because the government was stupid enough to follow the Americans into Iraq. From 2009 Home Office figures, 92% of those in British prisons for terrorist offences affirm themselves to be Muslim. It is worth noting that these are not usually international actors – 62%, a clear majority, are British citizens. Since the 7/7 attacks the government has spent millions on de-radicalisation programmes, and a new term ‘Al Qaeda inspired terrorism’ has been coined. The fact that British Jihadis existed well before Osama Bin Laden’s name was widely known is conveniently forgotten, and a concerted government and police drive has occurred to remove any religious terms from discourse about terrorism. This has been the backdrop to an on-going conflict between government and Muslim representative organisations. Programmes such as Preventing Violent Extremism have been attacked for ‘stigmatising Muslims’ until Prevent was extended to include the far-right and even, ludicrously, animal rights extremism. One consequence of such arguments has been that each new conviction following a terrorist plot, or each involvement of a Briton in a plot abroad, is presented as a surprise, or attention is instead switched to exposing ‘Islamophobic reporting’ by the media, rather than the act itself. This reached surreal levels when the 2009 Christmas Day ‘underpant bomber’ became the fourth former executive member of a University Islamic Society to be involved in an attempt to commit the mass murder of civilians. The Federation of Student Islamic Societies responded by insisting there was no evidence Muslim students are more prone to radicalisation than anyone else. What more evidence do we need? Anarchists need to avoid the type of auto-leftism that dominates certain groups. We should be better than simply repeating the discourse of ‘Islamophobia’, and Muslims solely as victims, that the left has produced readily since 9/11. Secondly, as Anarchists we should fear religious belief per se – because of its irrationality, its treatment of women, its ability to divide human beings and its long association with injustice. We need to be realistic. 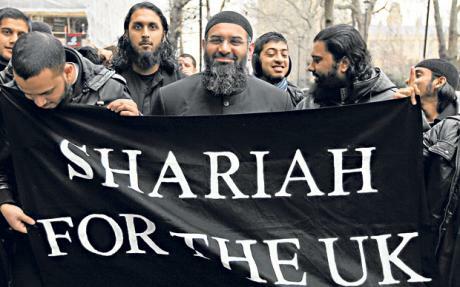 Outside of the fantasies of the EDL and Muslims Against Crusades, shariah law is not about to be introduced in the UK. But there are politicians daft enough to cede power to shariah courts and Muslim Arbitration Tribunals at a local level (certainly for civil matters), and there are certainly Muslim organisations in our cities happy to soak up whatever power they can. If history has taught us anything, it should be that when power is ceded to religious currents, they rarely if ever give it back. Anarchist rejection of the law may not sit easily with campaigners such as Maryam Namazie and the One Law For All campaign, but we need to reflect on whether it is better to support such campaigns than see the consolidation of structures based on superstition, hierarchy and patriarchy. Islamic organisations, backed by significant funding both from within the UK and abroad, are becoming a permanent presence in parts of the education and welfare systems. Having learned nothing from religiously divided education in Northern Ireland (where most children go to separate Protestant or Catholic schools from the age of five) the development of Muslim only schools is likely to not only do little for integration in our communities, but will even reverse it. As London Mayor, Ken Livingstone awarded £1.6 million to East London Mosque for its welfare programmes – oh for the days when religious institutions that needed money for ‘good work’ did jumble sales! Such processes consolidate reactionary groups such as the Islamic Forum of Europe - they gain status, funding and power. There is no need for secular institutions to ask what services members of the public want or need when they can instead ask the mosque or any representative organisation that steps forward. We need to be aware Cameron’s big society may provide further opportunities for such nonsense, not less. We must also fear the increased racialisation of politics. If there is such a thing as the ‘Muslim community’ with elected representatives, there is by definition such a thing as the white community. And we should know where that brand of politics takes us. There is a need to stress the type of alternative, bottom up multi-culturalism that we live with and support daily – getting on with neighbours, colleagues and school friends as people, not as identities based on their colour or creed. Joining together with people as fellow workers and fellow members of working class communities targeted by cuts will be a lot easier on that basis, than the multi-culturalism of the state and the left. Such an approach to me is Anarchism, and we need to stress that practice, whilst never abandoning Anarchist principles such as ‘No Gods, No Masters’, in the years to come. Editorial - Opium of the people? Now, I'm not surprised by the perspective in this article- it pretty well fits with what people in Class War have been saying about Islam for a few years. And there has been debate around it, again for at least a few years, so I dispute the claim that "it is a debate that is long overdue". Secondly I also dispute the importance attributed to the issue. [the global Islamic] resurgence was – and is – an event as important as the French or Russian revolutions. On what basis is this even close to being true? The French revolution was the triumph of capitalism over feudalism, setting the scene for the dominant new economic system for the whole planet. The Russian revolution was the world's first major proletarian revolution and experiment in socialism, which was crushed and instead turned into the second imperialist superpower and led to the Cold War, which dominated much of the world's political life over the past 100 years. The supposed growth of political Islam has had nowhere near as big an impact as either of these two events, no matter what the Daily Express says. Then the article talks about "Asian" and "Muslim" Councillors switching from one political party to another. I really don't see what is surprising about local politicians being opportunistic with their party affiliations. What is new here, or different from politicians of any other ethnicity doing the same? As for the statement "the most important political institution in east London is not the Labour Party or a trades union – it is East London Mosque", this seems more like hysteria that fact. Having lived in East London myself for nearly 10 years I think I can pretty much safely say that the mosque has had zero impact on my life. I also find it quite concerning that the author refers to "Islamists" in office being as useless and representing the working class as anyone else. Of course I agree that you can't represent the working class in elected office. However, the author seems to refer to Mayor Lutfur Rahman as one of these "Islamists", but he is not. His ethnicity is Muslim but he himself is a left social democrat. As for Dr Muhammad Bari, a quick Google of him shows that he is also Muslim, but there is no evidence that he is an Islamist. Are there actually any Islamists who have been elected to positions of power in the UK? Maybe there are a couple, but whether there are or not there are still far far more Christians in positions of power whose religious ideas affect their political ones. So why the focus on Muslims? Although rarely acknowledged, a small, but not insignificant number of British Muslims have been fighting, killing and dying in their version of Jihad for the best part of three decades, in places as diverse as Bosnia, Kashmir, Yemen, Afghanistan, Somalia, Iraq and Israel. I assume the author knows the numbers of these, as he states it is "significant" so I would ask what is the number? Not that it is relevant anyway. In terms of Bosnia, white socialists went to fight there on the Muslim side, so why does this paint Muslims in a particularly bad light? As for Israel, far more British people go there to fight for the IDF. And as for Afghanistan and Iraqi - the vast majority of people there shooting people and blowing things up are not Muslims, they are white people (probably mostly Christian) in the British Army. So again why focus on Islam here, when in terms of the amount of violence actually being carried out it is so much less than that by people of other religions? The first British suicide bomber died in Srinagar as far back as 2000 – so much for the idea that such attacks solely occur because the government was stupid enough to follow the Americans into Iraq. who has ever said that suicide bombings only happen after the UK invaded Iraq? Plenty of people - correctly - stated that the UK being involved in the invasions of Afghanistan and Iraq would make the UK more of a target for Islamic terrorists, and surprise surprise it did. I'm particularly surprised that a former Class War member now seems to be condemning anti-imperialist terrorism. Class War were virulent supporters of the IRA: religious-influenced terrorists who attacked civilians in the UK because the UK had invaded "their" country. Why support them, but not Muslims, despite the invasion of Muslim countries being so much more recent and violent? As for Preventing Violent Extremism, is there any evidence about it targeting people other than Muslims? When in my Council PVE was due to come in, many staff were concerned that it would be used to stigmatise Muslims, and asked me to raise this as a union issue, stating that Islamic extremism has never been an issue in our area, so why couldn't we use the funding to do more integration type work and oppose all types of extremism including racism. Management said that don't worry it would be used to target the far right as well, but it was not, it was only aimed at Muslims. I'm aware of one member of staff even refusing instructions from management to generate lists of Muslims to be targeted by the project as she felt it was discriminatory. This reached surreal levels when the 2009 Christmas Day ‘underpant bomber’ became the fourth former executive member of a University Islamic Society to be involved in an attempt to commit the mass murder of civilians. The Federation of Student Islamic Societies responded by insisting there was no evidence Muslim students are more prone to radicalisation than anyone else. What more evidence do we need? As an anarchist, does the author see any qualitative difference between the authoritarian violence of a state (by the British Army) and the authoritarian violence of a proto-state (Islamist terrorist groups)? I certainly do not - and far more Christians in role in the Army to go around murdering Muslims than do Muslims murdering Christians. Or is violence only bad when it is not carried out by the state, its only legitimate user? Being an anarchist, of course I'm opposed to the entire bourgeois legal system. But why is this qualitatively worse than anything else? Especially as they only have authority if people agree to go to them. And directly comparable Jewish Beth Din courts have been around in the UK for hundreds of years - so again why the focus on Muslims? The article then complains about public money being given to Muslim bodies like East London Mosque - again with no comparison to the huge amounts of public money given to Christian organisations. In the conclusion the article states that "Anarchists need to avoid the type of auto-leftism that dominates certain groups". But more importantly we need to avoid racist tabloid hysteria was deliberately scapegoating a tiny, disproportionately poor and working class, section of society for all our problems. This article makes no attempt to put the "problem" of Islam into any kind of context by comparing with other political forces or religions which are predominantly white. In fact it expressly tries to avoid putting the problem in context by avoiding actual numbers and using percentages. E.g. "92% of those in British prisons for terrorist offences affirm themselves to be Muslim" - pointedly not mentioning that there are only about 100 people in prison for terrorist offences in total, and not mentioning that "terrorist offences" is a very broad term. It doesn't even put the problem of Islamic terrorism in the UK into any sort of perspective. Muslim terrorists have killed what under 60 people in the past 40 years, whereas nationalist terrorists, some of whom Class War supported, have killed many, many times that number. In Europe, 99.6% of terrorist attacks are carried out by non-Muslim groups. Unfortunately, this article is unsurprising, as Class War have been criticised in the past for their overreaction to parts of the left dropping their principles to cosy up to Muslims - the burning of the Arab caricature Mohammed on a bonfire, and support of members of the French headscarf ban, being two examples. Of course we should continue to criticise religion and religious intolerance, but that doesn't mean joining in enthusiastically in a racist tabloid witchhunt. This is a very very good post Steven. If you do write it, you should also send it to the editors of Shift. Yes, if you do write it, please send it to us, we'd like to publish it on our website as a response. We can also forward it to Paul Stott as I'm sure he'd appreciate the debate. Good post Steven. I found the article to come very close to bigotry. Perhaps that comes with reading too much Huntington and Kepel. Steven makes some good points. However,the exagerated claims and a certain lack of perspective in the opening text (and possibly unfortunate contrasts with the authors membership of the IRA supporting former 'Class War') should not destract us from criticising the ideology of multiculturalism and 'community politics' of the state and it's leftist supporters, or equally the significant influence of the muslim religion and politics in some sectors of the population in Britain. The referenced 'Aufheben' article in the library here is certainly worth reading in that respect. The relationship between the rise of political Islam and previous 'failed' anti-colonial struggles based on western liberal or 'socialist' ideologies should not be underestimated. It may not be critical in Britain but it has been a significant factor in the African and Arab world and inevitably has a spin off to the imigrant and migrant sectors of the population of other countries outside those regions. It does lean heavily on a particular view of 'capitalist decadence' but, whether you accept that or not, it makes some interesting points. Some references are a bit dated but some seem only too relevant today. Paul Stott's article needs a good critique - I don't like it, - but I'm not sure Steven knows enough about the issues to write it. Steven, go away and read the authors mentioned by Paul (Delwar Hussain, Kenan Malik, the Aufheben article) as well as Chetan Bhatt's 'Fetishism of the Margins' and the newish report on Sharia you can find on the WLUML website and then write it! Rachel, thanks for your faith in me! I read the Aufheben article years ago (I was the one who put it on here), and I read the sharia report, which I have issues with. I have read other stuff as well - but a big chunk of my point was that this is a pretty irrelevant issue with the cuts we are facing. I wrote my full response yesterday evening, I'm so busy with anti-cuts stuff at the moment that no way am I going to waste any more of my time on this. Please fill free to write something yourself though, or maybe try to get one of the Aufheben lot to! In fairness the role of Islam is probably comparable to zionism. Surely. we are not to blame if right-wing press attacks a right wing religio-political ideology, using arguments about defending Enlightenment values, which we share to an extent. We should not back down and say ooh dear, lets turn it round to a debate about race, so that we can attack the EDL and the Daily Mail on safe ground. Islam is a religion, gettit? that's pretty simplistic imho. 'Islam' clearly signifies more than simple belief, especially when we're talking about Islamism, which is a political programme, and normally in public discourse it's a thinly-veiled reference to dark-skinned people, foreigners whatever their citizenship status. in any case, an ethnicity is a self-defined group based on shared values, culture, heritage etc, so Islam could well be considered an ethnicity. ethnogenesis is often spawned by conflict and the consequent othering. to be honest that was an offhand comment, in my article response I changed it to religion, just because I didn't want its use sidetracking the issue. However, I do think that Muslim has become an ethnicity, rather than just a religion, in a similar way to being Jewish. Or would you not accept that what Serbia was doing to Muslims was "ethnic cleansing"? Not only that, but especially with the way the term has changed recently, the development of the "Muslim community", some people self identify as Muslim when they may not be religious at all. Similarly, there are loads of reports about issues related to Muslim ethnic groups in China, etc. I'm still really not sure why we need a specifically anarchist response to Islamic extremism and how, apart from the 'no gods no masters' section at the end, this could be considered anything other than a banal portrait of 'the situation'. in our former theoretical magazine (The Heavy Stuff Issue 5) our position in solidarity with the then Provisional IRA campaign was quite unequivocal. Yeh. The piece in HS5 was a letter from Doncaster CW in response to an article in HS4 which roundly condemned the IRA. This is therefore hardly proof positive of your point as I make clear in the debate on your effort. BTW, I look forward to your response to my various criticisms of your article. I have responded to your criticisms below my article. However, I doubt that your criticisms are meant in any sort of constructive way, seeing as how you are someone who has taken individual enjoyment in offending Muslims by persistently referring to them as "Moslems". Class war's newspaper stated that its organisational position was in solidarity with the IRA, later than the earlier articles which criticised it. I can only go by what the organisation itself stated. I hope I don't come off as being lazy, but I'm having a hard time navigating this discussion. Where was this most updated organizational position of Class War expressed? Which issue of which newspaper? Is this available online? no worries, I'm sure it seems pretty confusing! That whole paragraph does not appear to be very well thought out. That is not to say we have not made thorugh analyses in the past - in our former theoretical magazine (The Heavy Stuff Issue 5) our position in solidarity with the then Provisional IRA campaign was quite unequivocal. That support came at a time and in a context of the nationalist communities of the six counties fighting an all out war. As a class and as an oppressed nationality, against the British state, its soldiers and the loyalist death squads. In the face of bitter repression by the state, through murder and internment without trial, the bombing campaign against the British mainland was initiated. That bombing was part of the context of the overall struggle which people of both islands could see. Although we had reservations about the dangers of innocent civilians lives being lost, and harsh criticism of the more thoughtless and irresponsible bombings, overall we recognize it was part of a mass armed uprising. So was it or wasn't it unequivocal? Was it unequivocal with reservations developing subsequently?